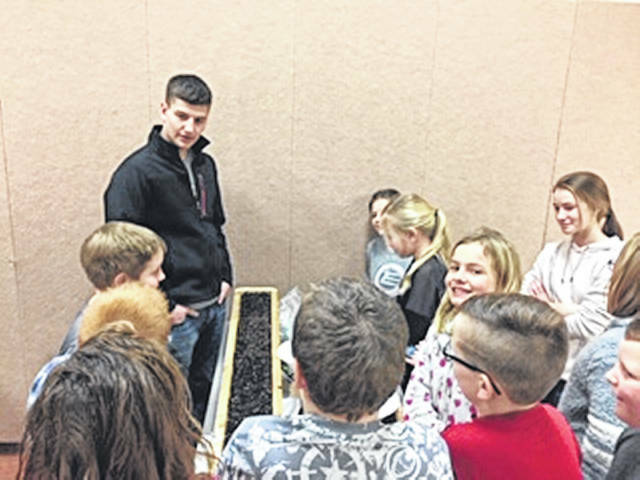 Anna FFA member Gage Wannemacher assists Anna Elementary third-graders in planting peas. ANNA — Members of the Anna FFA went to the Anna Elementary recently to teach third-grade students about the life cycle of a pea and how to plant them. The classes were first taught about the life cycle of a pea plant, and how a seed transforms into a cotyledon, seedling, then adult plant, which produces flowers. Once the students learned about the plant, they were able to plant their own peas. After three months, the third graders will collect all the peas that were produced from the flower and weigh them. The school that weighs the most peas is rewarded with a pizza party. The contest is between Anna, Botkins, Fairlawn and Jackson Center Schools. This contest is sponsored by the Shelby County Farm Bureau. The writer is the Anna FFA reporter.